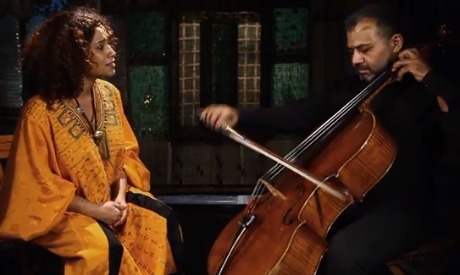 So sings Tunisian musician Ghalia Benali in Arabic, accompanied by Egyptian musician Khaled Dagher on the cello, in a song celebrating the “Silence is not Acceptance”, a campaign by UN Women’s Regional Office for Arab States supporting female survivors of violence, and directed by Egyptian filmmaker Tamer Eissa. "Silence is not Acceptance" comes as part of a 16-day UN global campaign of activism against gender-based violence. This annual campaign opens on 25 November on the occasion of the International Day to Eliminate Violence against Women and running until 10 December, also the International Human Rights Day. As El-Sheikh proceeds to explain, 6 out of 10 women decide to remain silent about their experiences with violence, and suffer because of the social stigma that makes it difficult for women to speak up about such situations. According to the UN Women's website, a third of the world’s women “have experienced physical or sexual violence,” but lack the support they need to report these incidents. The campaign stresses that if female survivors of violence find supporters within their communities, they could come forward, speak up and seek assistance. As such, El-Sheikh explains, the campaign becomes a call for action, urging people in all communities to express solidarity with and support for female survivors of violence. Tunisian singer Ghalia Benali is one of the campaign's celebrity advocates. “Ghalia was very enthusiastic about the song, and believed very much in the cause,” El-Sheikh asserts. “Her song expressed everything we wanted to say. It is a perfect opening for our campaign,” she adds. Besides Benali, other celebrity advocates for this year’s campaign include Syrian actress Kinda Alloush, and Egyptian screenwriter Mariam Naoum. As part of this campaign, UN Women is scheduled to hold an array of events and advocacy initiatives, which include an art performance in Aswan, a poetry and theatre festival in Jordan and a theatre performance in Morocco.